RP36497PB is rated 4.3 out of 5 by 3. Rated 5 out of 5 by CarMechanic from Great Replacement Needed to replace existing faucet in bathroom. This one was an exact replacement. Well packaged and received quickly. Not available at home stores. Easy to install. Works great. Rated 5 out of 5 by mizpicky from Extraordinary service & return service This product was shipped promptly, well-packaged, etc. Unfortunately, it didn't sync with existing plumbing so I had to return it. Your returns process and considerate, competant staff made even that chore a breeze. Thank you all! Rated 3 out of 5 by Homeimproverslave from Installation problem the tightening screw has a very shallow allen wrench socket. 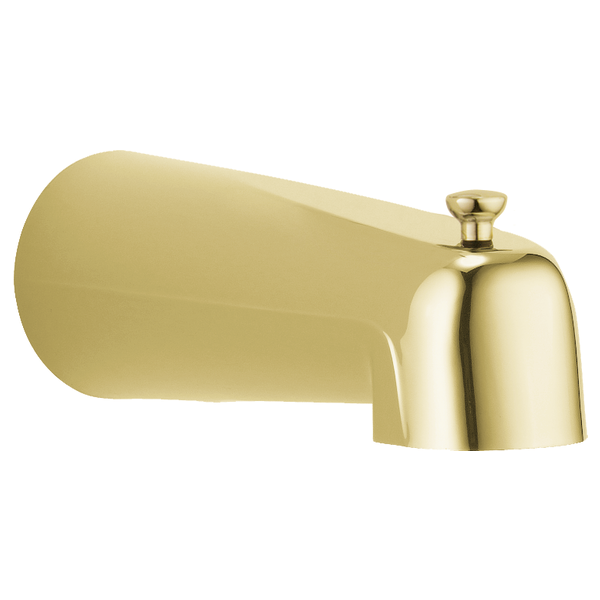 Delta Tub Spout - Pull-Up Long Diverter - RP36497PB -the finish on this delta spout notes Billiance. I am actually trying to match this to some Chicago Faucet fittings with no sealer on the brass, which darkens over time ( Something I like) can this finish be removed with, say, lacquer thinner? other chemical? thanks! Is this spout compatible with the spout adapter that is used for model RP17453? I need a longer spout but dont want to have to change the current copper pipe configuration. DO YOU CARRY A TUB SPOUT LIKE THIS BUT 9&quot;?